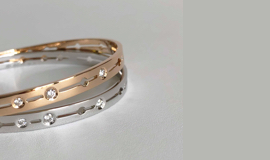 The materials of your piece of jewelry have been meticulously selected and manufacturing has been realized with the greatest care to offer you a first class piece. dinh van’s creations are precious pieces of jewelry that require high care if you wish to preserve them. To preserve its beauty and brightness, we suggest you to take into account the following gestures and precaution advices. 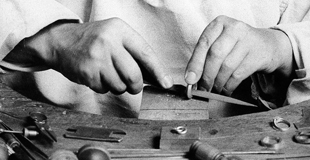 Repetitive shocks on your piece of jewelry due to its daily use will give it a patina. If you wish to limit them, remove it at home for housekeeping (detergents can damage the metal), when doing sport or when swimming at the beach or in a swimming pool (the sand grains matify the jewel surface, and chlorinated water oxides metal). Pieces of jewelry get damaged together by scratching or knocking: avoid wearing them in accumulation, on the wrist or neck. Unworn, store your piece of jewelry individually in its box to avoid frictions and scratches with other pieces of jewelry, especially set-with-diamond ones, that scratch easily. Do not store them in your bathroom: some metals like silver do not withstand under high humidity conditions. Put on your piece of jewelry after you have put make-up on, perfumed and done your hair: the acid or alkaline cosmetic products damage organic stones. If your piece of jewelry is tarnished or scratched it can be polished again, as far as possible, which will give its brightness back. 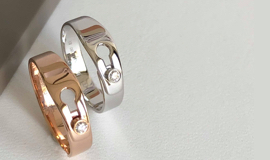 A white gold or silver piece of jewelry will then have to be rhodium-plated, recovered with a thin layer of rhodium, resistant material from the platinum group metals, which will give colour and brilliance back. If you have any doubt about your dinh van piece of jewelry, please stop wearing it and have it examined by one of our specialists: dinh van will be pleased to welcome you in order to look at your piece of jewelry. 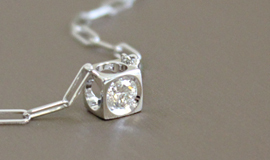 A silver piece of jewelry is delicate and should be treated with the greatest care. Silver is a softer metal than gold: knocks and stripes will be quickly visible on the piece of jewelry’s surface. Its life and wearing will create its unique patina and charm. Your silver piece of jewelry can be regularly cleaned to intensify its sparkle : scrub it softly with a dry microfiber soft cloth. You can also use a special silver piece of jewelry cleaning bath you can buy in drugstores. When it is tarnished or scratched, your silver piece of jewelry can be re-polished to restore its original sparkle, as far as possible. Then, a new coat of rhodium will be applied. This resistant metal of the platinum family will bring back its color and shine. Maillon Icon pieces of jewelry are protected by silvering, thin coat of fine silver. A gold piece of jewelry with pearls or ornamental stones is delicate and should be treated with the greatest care. When you are wearing your piece of jewelry, avoid knocking it and limit stripes risks that could modify its appearance. Remove your piece of jewelry for household tasks: regular contact with household detergents may damage pearls or stones. We advise you not to wear your piece of jewelry when you are practicing sports, when you are at the beach or at the swimming-pool: by frictions, the sand can matt the jewel’s surface and water strongly chlorinated can oxidize the metal. 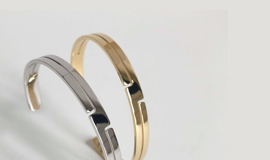 It is important not to wear your piece of jewelry in accumulation on wrists, neck and fingers: the jewelry piece could be damaged by striking against each other. When not worn, your piece of jewelry should be stored in its dinh van jewel-case, given when purchased. We also advise you not to put several pieces of jewelry in the same jewel-case as they can scratch by rubbing against each other. Keep the clasp open, far away from pearls and stones to avoid damages. Pearls need to hydrate in the open air ; they can dehydrate if they are kept in a coffer during long periods of time. Wear them regularly and enjoy them! Pearls and some stones like mother-of-pearl or coral are organic gems. Therefore, they need special attention because their porous surface is more sensitive. Pearls and stones can get damaged if in contact with acid or alkaline products, or in moist atmosphere. In order to preserve their sparkle and not to damage irremediably the pearl coat, we advise you to avoid putting them in touch with cosmetics, hairspray or fragrance. We recommend you to put on your jewel after applying your make-up and doing your hair. We advise you to often delicately wipe it with a soft cloth before putting it away it its jewel-case. The threading can give a rigid aspect to your pearl necklace or bracelet. However, as it is slightly loosening, the jewelry piece will quickly embrace the form of your neck or your wrist after few wearings. Be careful: water can weaken the threading ; do not expose your bracelet when you are washing your hands and taking your shower or bath. We strongly recommend you to yearly re-string the pearls in order to avoid risk of damage.